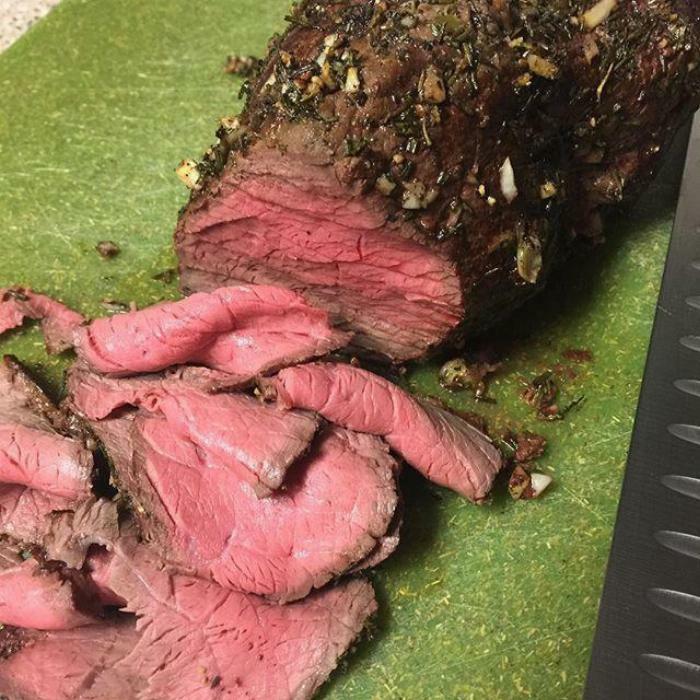 This roast beef is AHHMAZING and I promise you will never buy store bought roast beef again. The best part of this is the tremendous savings! At our deli it is about $14/lb and you can buy the meat for under $5/lb. You do the math. Shop smart! 2In a small bowl, stir together 1/8 C olive oil, rosemary, garlic, and lime zest; season with salt and pepper. 3In a cast iron skillet, heat 2 tablespoon oil over medium-high. Pat beef dry and add to skillet and brown on all sides, about 10 minutes. Remove pan from heat and roast from pan to prepare it. 4Brush rosemary mixture over roast and place back in skillet and in oven. Roast Beef is done when an instant-read thermometer inserted in thickest part of roast reads 145 degrees. 30 to 35 minutes. 5Transfer roast to a cutting board, cover loosely with foil, and let rest 10 minutes. 6Thinly slice meat against the grain with a slicing knife. A meat slicer would make this task easier if available for uniformity. Refrigerate and enjoy as a cold cut or use it later for a hot roast beef and cheese sandwich.